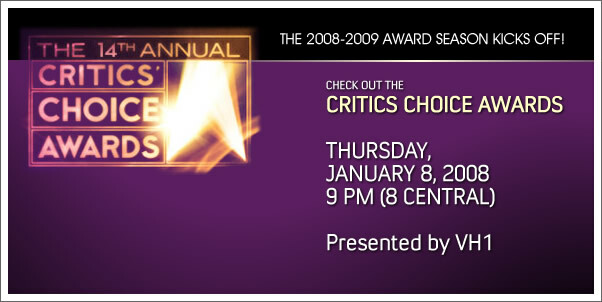 The 2008-2009 Award season gets underway tomorrow night with the 14th annual CRITICS CHOICE AWARDS. You can get an early jump on everyone who thinks the Golden Globies is the start of the season, by tuning into VH1 tomorrow night at 9 PM (8 central) to catch another great award show. In case you missed who the nominees are this year, check out my earlier post here. In the interest of full disclosure of the award show pimpage going on here, last year I was privileged enough to become a part of the Broadcast Film Critics Association (the organization behind the Critics Choice Awards). As a member, I have already cast my final votes for this years nominees. It's quite an honor being a part of this organization and wish I had been able to attend the awards show this year. You better believe I'll be there next year! So join me in watching via the tube tomorrow night!